Butch Cassidy's birth name was Leroy Parker. He was born in Circleville, Utah in 1866, the oldest of 7 children. His father was an elder in the Mormon Church. Butch Cassidy never killed anyone, and the Sundance Kid killed only one person. They were two of the principle leaders of a notorious group of bandits who were called the “Wild Bunch” or the “Hole in the Wall Gang.” The Wild Bunch operated out of a rugged region of Utah that was filled with swift rivers and towering canyons that became known as the “Hole in the Wall.” At its height, the gang was known to have numbered as many as 100 men. During the 1890's, the Wild Bunch survived by stealing cattle and selling them to buyers in Utah and Colorado. This endeavor ended when Butch was apprehended in Wyoming and sentenced to 2 years in prison. Upon his release he promised never to return to Wyoming again. It was at this time that he started hiding from the authorities at the Hole in the Wall. Butch was soon joined by another cattle rustler from Sundance, Wyoming. His name was Harry Longabaugh, and Harry fled to the Hole in the Wall after killing a deputy sheriff. It was at this time that he became known as the Sundance Kid. Before long they were joined by another well known cattle rustler who had also killed a U.S. Deputy Marshall. His name was Harvey Logan and not long after arriving at the Hole in the Wall he became known as Kid Curry. The Hole in the Wall gang also included women. Probably the best known of these was Etta Place who became the companion of the Sundance Kid. 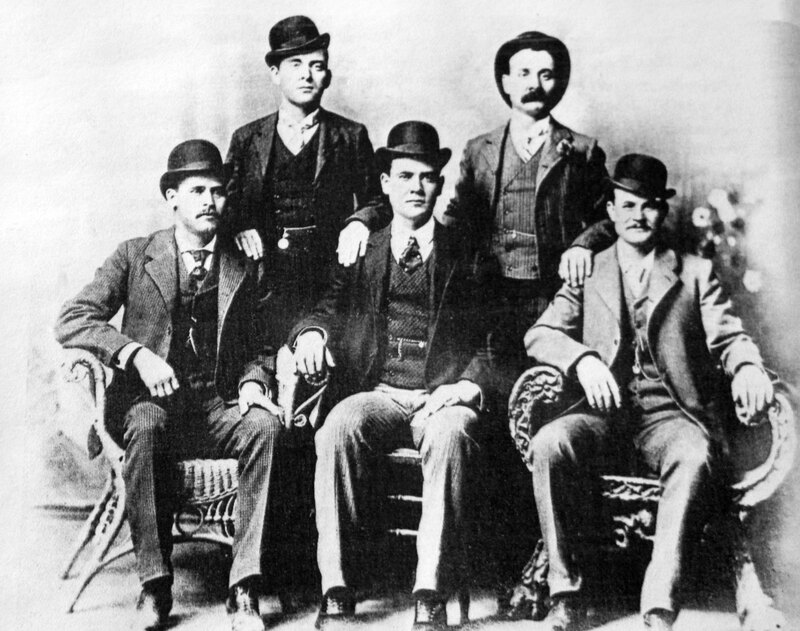 The Wild Bunch robbed their first bank on August 23, 1896, in Montpelier, Idaho. Unfortunately, there was not much money in this bank. Before long, they decided to start robbing mines. The first mine they chose to rob was in Castle Gate, Utah. Soon afterward, Butch Cassidy and a woman companion named Elza Lay applied for work at a mine. Disguised, they rode old beaten down horses, and acted like they were dead broke. Butch spat tobacco juice and wore bid overalls as he applied for a job. The next morning they returned to the mine and relieved the owners of $8,000, which was an amazing amount of money. However, Butch was not done. Just a short time later Butch robbed a bank in Belle Fouche, Dakota, of over $30,000. At this time the Pinkerton detectives were successfully breaking outlaw gangs and they quickly took an interest in the Hole in the Wall Gang as they were now called. It wasn't long before the Pinkerton detectives were now hot the gangs trail, so the gang temporarily disbanded until the end of the Spanish American War. After reuniting, the Hole in the Wall Gang decided to rob trains. They used dynamite in Caspar, Wyoming to rob the Union Pacific Railroad out of $30,000. Almost at once the Pinkerton detectives gave chase. After killing a deputy sheriff the Hole in the Wall Gang scattered in all directions. The gangs luck ran out after they decided to have a group photo taken. Before this time the authorities had no idea what the Butch and Sundance looked like. Now every lawman in the United States was looking for them, so they decided to do one more robbery before fleeing to South America. In one final act of defiance they robbed $50,000 from the Great Northern Railroad in Malta, Montana. Just a short time later, Kid Curry was captured and given 15 years in prison. At this time Butch, Sundance, and Eta Place sailed to Buenas Aires and bought a ranch on the Chilean border. There they continued to rob until they held up a mine in Bolivia and were all killed.